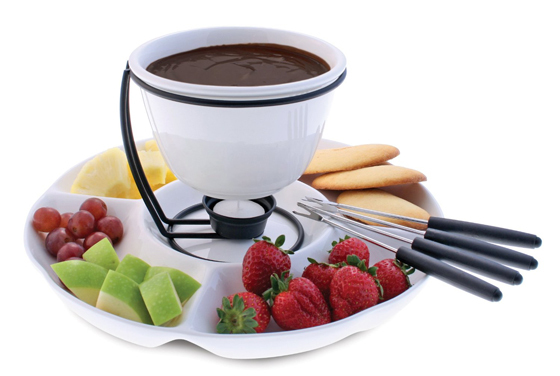 Fondue is always a fun and stylish way to serve desserts. Melt your favorite chocolate and try dipping fruits, cookies, brownies, marshmallows, pound cake and cheesecake – you won’t believe the endless possibilities. 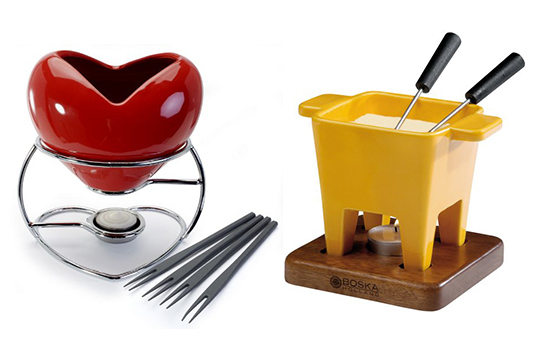 Here we prepare 6 Cool Tea-light Dessert Fondue Sets, from personal fondue mug to a set serving up to 5 people. What can be better than enjoy a delicious European tradition from the comfort of home in the winter? This beautiful fondue set includes a white porcelain plate, a 22 ounce porcelain bowl, black iron stand, four fondue forks and a tea light candle for low heat flame. The plate includes 5 defined and sizable compartments which allows you to separate food. Moreover, this set is easily take apart. If you want, you can use its component separately. Earthenware pot, mahogany base, tea light – this Tapas-style fondue set is perfectly for 1 or 2 people. A large glass bowl, a bamboo stand and four bamboo skewers, this eye-catching fondue set bring the perfect dessert to the table. 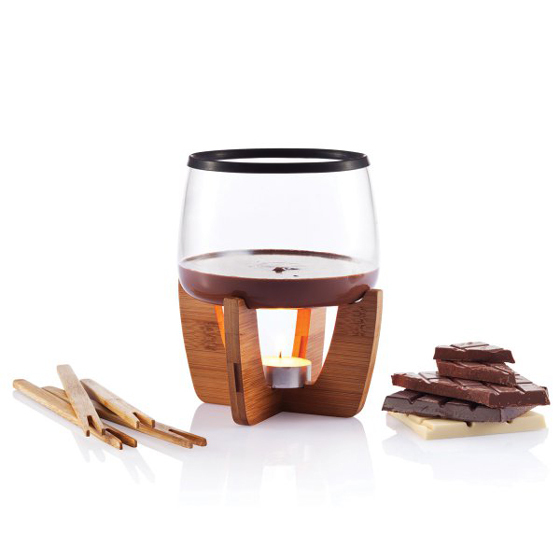 The glass allows you an open view of the chocolate to be enjoyed with friends or after a romantic dinner for two. 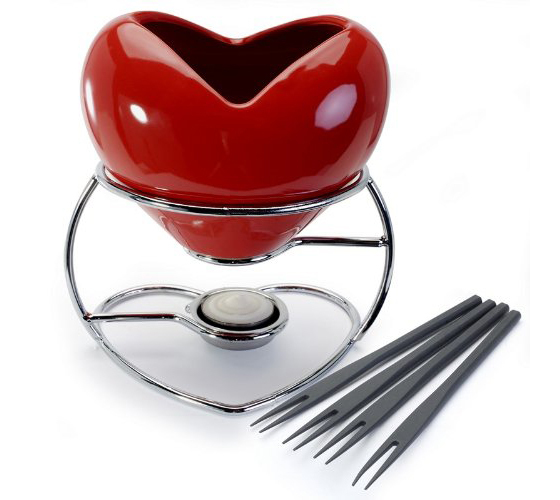 This adorable hearted shaped fondue set is the perfect way to create a romantic yet delicious after-dinner treat. Use to melt your favorite chocolate and try dipping fruits, cookies, brownies, marshmallows, pound cake, cheesecake, etc. 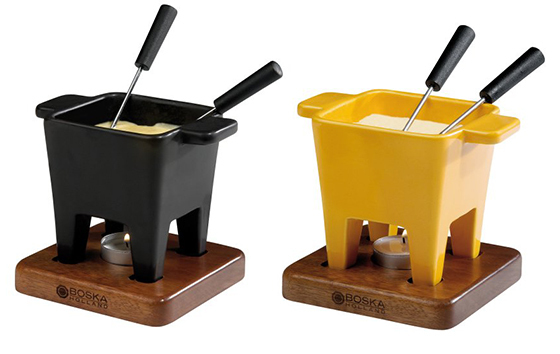 It is always good to share fondue with others. 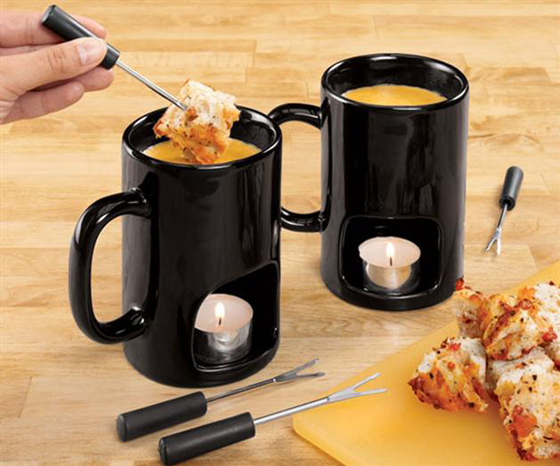 But sometimes, when you are alone, you still want to enjoy the foudue but don’t want all the mess it creates, personal fondue mug is here for you. It allows you to easily make fondue from your home, melting your choice of either cheese or chocolate perfect for dipping everything from fruits, veggies, and bread and much more. Having a fondue party is a great way to entertain friends, and sharing fondue on lazy Susan set make the experience even enjoyable. 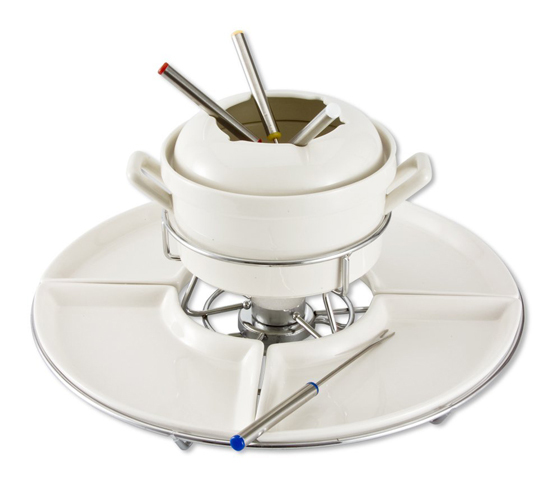 Including stand, burner, fondue pot, 4 plates and 4 food spears, this Godinger Fondue and Lazy Susan Set is perfect for diner of 4.